The Dispatch is a unique mid-size van which features an architecture that's been crafted to offer more comfort, practicality and safety. It’s certainly the van to have if you’re in need of a vehicle that tends to your motoring needs as it boasts the latest engine technologies and in driver assistance. The exciting new Dispatch has been inspired by SUV’s and passenger vehicles, and its new styling is attractive and practical. It has load volumes that highlights its confidence and robustness. At the front there's a short horizontal bonnet that sits above the big headlight which are placed high up to give the driver excellent visibility and a dominating position on the road. 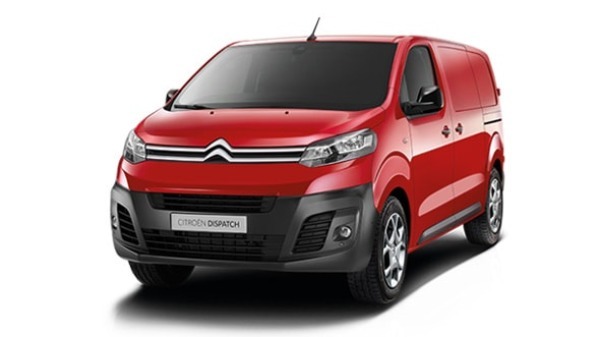 The new Citroen Dispatch comes with a choice of 3 lengths, and in addition to the core-market M(4.95 m) and XL (5.30 m) versions, there is an all-new practical and compact 4.60-m model. Similar to the M and XL lengths, the XS version provides a payload of 1,400kg. The XS and M versions have a height of just 1.90m. The new Dispatch can easily access car parks, not an easy task for some vehicles in this class so you save time from circling the streets because the entrance is too low, and you can save time by parking closer to your customers. Got Your Hands Full? Don’t worry - this panel van comes with an optional hands free function so you can close/open the doors without touching them. To do this, simply pass your foot under the corner of the rear bumper and the Dispatch unlocks and automatically opens the door on the side you’re standing on. Clever right! Practical and efficient architecture is apparent throughout this van. It can adapt to all your needs thanks to the new specially reinforced modular platform which gives the Dispatch functionality and easy use. 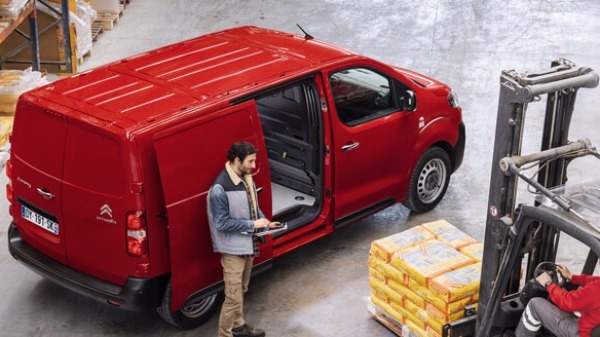 With a payload of up to 1,400 kg, a 6.6 m3 of load volume and the ability to tow up to 2.5 tonnes, the Dispatch panel van can tackle any load you challenge it with ease. This same modular design is also reflected in the 2 wheelbases (2.92 m and 3.27 m) and two rear overhangs (0.80 m and 1.15 m). The Dispatch has comfort at your service! 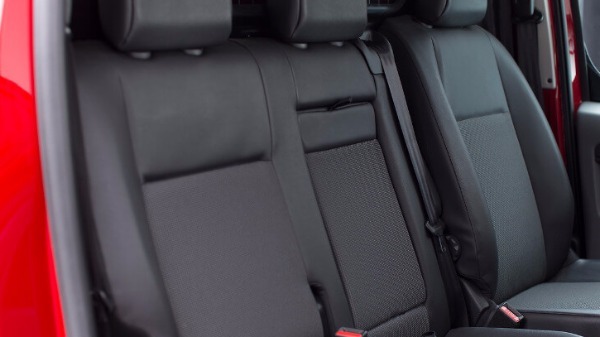 The seats, dashboard and smooth ride provides the ultimate comfort for you and passengers. You can even turn the cabin into a mobile office. Simply lower the central arm rest and you have a pivoting table tablet with an elastic strap. This is great for preventings laptops and folders from sliding. You can also opt for extra accessories such as special holders for smartphones and tablets. Depending on what you need a van for, the new Dispatch comes with 2 types of panelling including unfinished wood and treated wood (easy to wash, waterproof, protected, anti-slip and protected by aluminium sills). Various combined kits are available to protect the floor and load area alone or side panelling as well as the height and wheel arches. Storage is covered, as there are numerous compartments throughout the Dispatch’s cabin including a glove compartment containing a jack, 12V sockets and a USB (dependable on the version), a spacious storage compartment under the passenger seat - perfect for storing a hard hat or pair of boots. In addition to this there is a central overhead open storage compartment, 2 doors pockets capable of holding 1.5L bottles and cup holders on the dashboard. Offering technology that makes your travelling business life easy, the Dispatch will cater to all your driving needs. With Park Assist 180°, the 7” touch screen will display you an excellent view from the overhead rear camera. When you drive too close to an object, the systems zooms in so you can see how much distance is left. With grip control, you can adjust the front wheel grip according to the type of terrain. The advanced Grip Control system can be combined with the Worksite Pack (this allows for a heavier payload, protective plate under engine and a 20mm higher suspension). This feature gives the Dispatch improved traction of trick surfaces such as dirt roads, worksites and trails. The Colour Head-Up Display technology is a first for a vehicle in this segment, and it helps you keep your eyes on the road, allowing you to still be able to view essential driver information such as current/recommended speed, speed limiter/cruise control settings, collision alert and navigation instructions. This is presented on a transparent strip in the front of the windscreen. 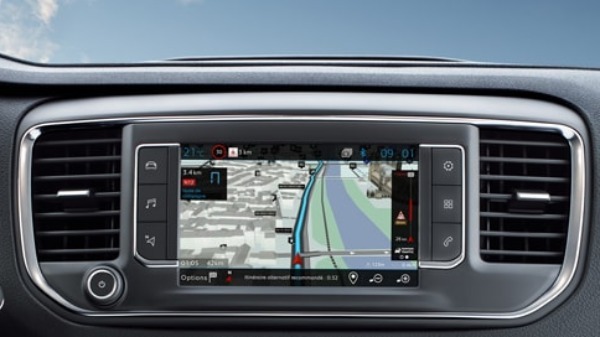 Depending on which grade you opt for, there is also Citroens Connect Nav which is a new 3D navigation system which can be controlled either by the 7” touchscreen or voice. This feature keeps you connected with the world, delivering TomTom traffic, real time information, the location of car parks and prices and service stations, as well as a search function for nearby points of interest. There is also the danger zones option, this makes you aware of areas that have a higher risk of accidents. Active cruise control - this adapts to the vehicle in fronts speed. This automatic system can reduce speed to 20km just by acting on the accelerator. Blind Spot Monitoring System - this warns you when there is a vehicle in a blind spot and acts as an extra pair of eyes. Road sign reader - a new system that operates with a camera at the top of the windscreen. It helps keep the driver informed at all times of the current speed limit. When it detects a speed limit sign, simply press the button to set the recommended speed limit. Active Safety Brake - this is a system that gets activated by the multi-function camera that is fitted above the windscreen. It reduces injuries to passengers by quickly braking before the driver does. 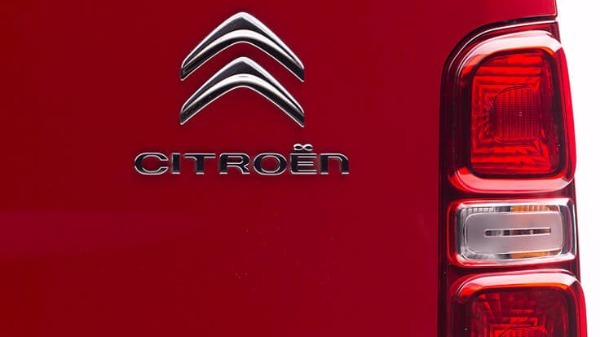 This magnificent model comes with Citroens diesel engines in the Euro-6 BlueHDi family. These engines have been around since 2013 and are known for drastically reducing nitrogen oxide emissions whilst lowering CO2 emissions at the same time.